Historically the urban festival served as an occasion for affirming shared convictions and identities in the life of the city. Whether religious or civic in nature, these events provided tangible expressions of social, cultural, political and religious cohesion, often reaffirming... read full description below. Historically the urban festival served as an occasion for affirming shared convictions and identities in the life of the city. Whether religious or civic in nature, these events provided tangible expressions of social, cultural, political and religious cohesion, often reaffirming a particular shared ethos within very diverse urban landscapes. Architecture has long served as a key aspect of this process exhibiting continuity in the flux of these representations; through the parading of elaborate ceremonial floats; the construction of temporary buildings; the `dressing' of existing urban space; and the construction of new buildings and spaces which then become a part of the background fabric of the city. This book examines how festival can be used as a lens to examine the relationship between city and citizen and questions whether this is fixed through time, or has been transformed as a response to changes in the modern urban condition. 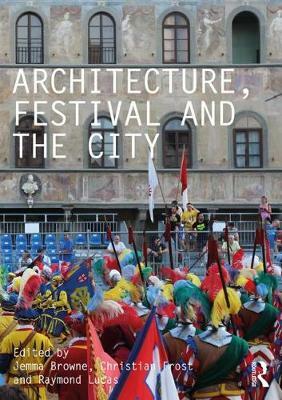 Through contributed chapters, it looks at the multi-layered nature of many festivals; in the way they incorporate both orderly (authoritative) and disorderly (subversive) components, revealing new themes of how the civic nature of urban space is utilised through festival to represent ideas of belonging. Recent political and social gatherings also raise questions such as what is the relationship of such events to `ritual' and whether traditional practices can serve as meaningful references in the twenty-first century. Jemma Browne is a lecturer in history and theory of Architecture at the Birmingham School of Architecture and Design, where she also teaches in the architectural and interior design studios. She has recently submitted her Doctoral thesis for examination titled Spatial Representations of Memory and Identity: An Urban Cultural Topography. Her research examines how post-industrial cities in the UK are spatially transformed through time by the layering of new and existing expressions of cultural identity, in particular as a result of postcolonial migration. Before working in architectural practice, she ran homelessness projects and worked in many different roles in the housing and social justice charity sector; this experience and commitment to equality and diversity continues to influence and shape her research interests and pedagogical approach. Christian Frost qualified as an architect in 1990 following the completion of his studies at the University of Cambridge and has practiced in Australia, Germany, and the United Kingdom. In 2001 he became a full-time academic and developed an interest in the medieval period that has resulted in several publications including the book Time, Space and Order: The Making of Medieval Salisbury (2009), and joint editorship of Bishop Robert Grosseteste and Lincoln Cathedral (2014). He is currently undertaking funded research into the continuity of festive iconography in Florence since the medieval period. In 2013 he became the Oscar Naddermier Professor of Architecture at the Birmingham School of Architecture and Design where he organises the delivery of history and theory of architecture and design throughout the school and runs a Masters design studio. Ray Lucas is Senior Lecturer in Architecture at the University of Manchester, where he served as Head of Department from 2014 to 2018. He has a PhD in Social Anthropology from the University of Aberdeen on A Theory of Notation as a Thinking Tool. From 2014 to 2018, Lucas was an Associate Researcher and External Advisor for anthropologist Tim Ingold's ERC Advanced Grant Knowing From the Inside which worked between the disciplines of anthropology, fine art, design, architecture and others in order to interrogate how we know our world. He is author of Research Methods for Architecture (Laurence King, 2016), Drawing Parallels: Knowledge Production in Axonometric, Isometric, and Oblique Drawings (Routledge, 2019), and Anthropology for Architects: Social Relations and the Built Environment (Bloomsbury 2019). Lucas's current research includes 'graphic anthropologies' on marketplaces in South Korea and urban festivals in Japan; he also has an interest in sensory design, film, and architecture, anthropology and geometry, and research into drawing.